Interested in an inexpensive tea subscription box? You’re in the right place! Check out our Simple Loose Leaf Tea review to see what they offer. We love affordable subscription boxes – check out our list of cheap subscription boxes to see other great options from all different categories. Forget coffee! 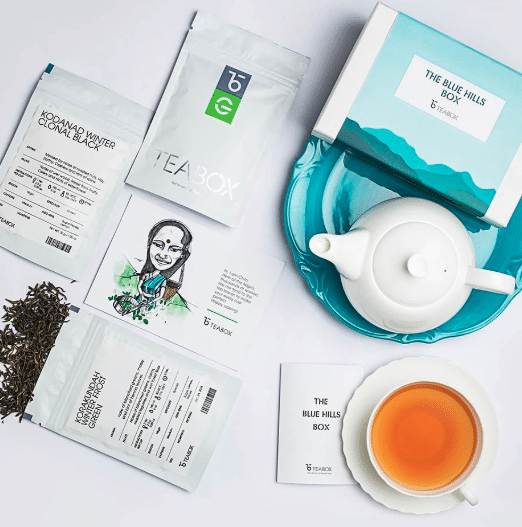 If you’re a tea fanatic, you must be curious about the tea subscription boxes that will provide you with new teas to try every month. I love tea, so I did some research after my experience with several other types of subscription boxes and stumbled across a few choices. The first one I decided to try was the Simple Loose Leaf tea subscription box. 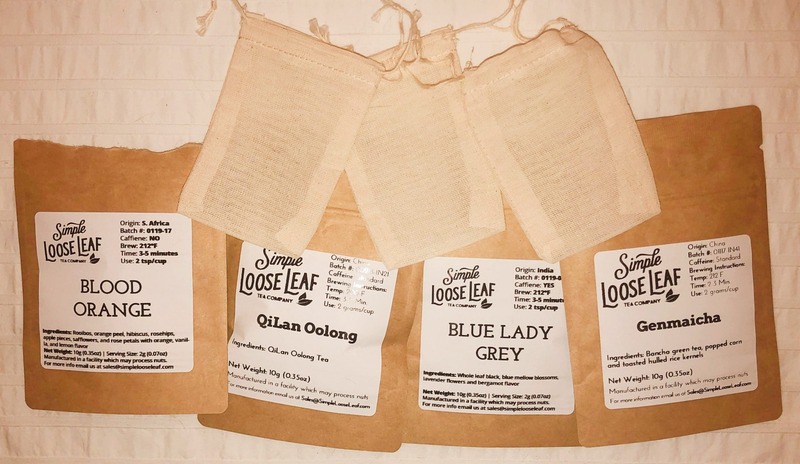 This Simple Loose Leaf Tea review describes their plans, coupon opportunities, a few similar tea subscriptions, and the unboxing of my first tea box! 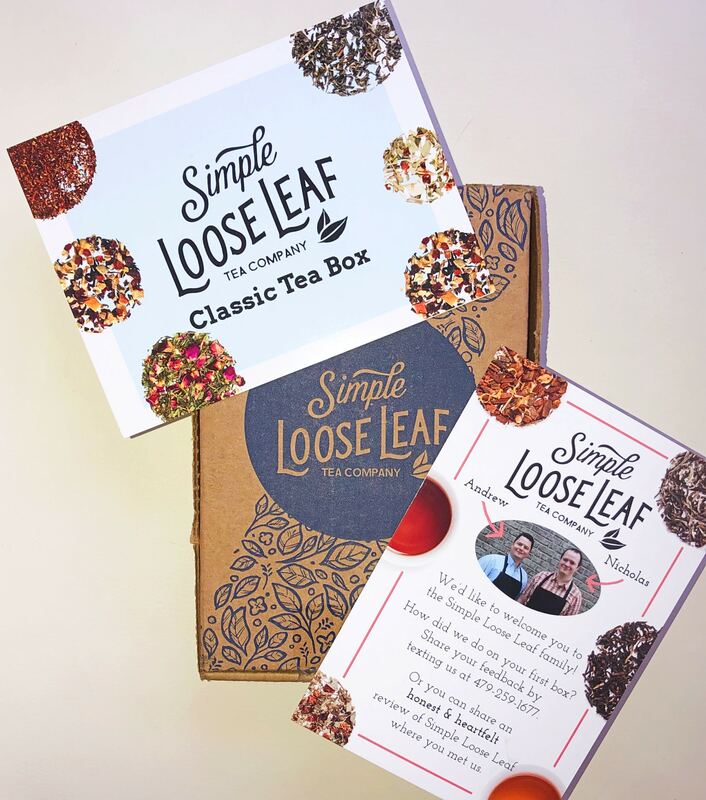 Simple Loose Leaf offers a monthly subscription box as well as a regular online shop where you can purchase all kinds of different teas. The teas in their shop can be added onto your monthly subscription, so you don’t have to pay extra for shipping. With the subscription box, you’ll receive four different teas to try from the Simple Loose Leaf tea company. They come in 10-gram bags, totaling about 12–16 cups of tea (2–3 cups per pouch). This measurement depends on the type of tea and how strong you like it. The box also comes with four drawstring linen pouches in case you don’t have a tea strainer at home. They have four box options: variety, caffeine-free, just black, or just green teas. Each box costs $9 per month plus a $2.99 shipping fee. At $11.99 per month, this means each tea costs between $0.75 cents and $1 per cup. They also have a quarterly option for the same price, but it’s shipped every three months. A few paragraphs below in this Simple Loose Leaf tea review, I’ll share the contents of my first variety tea box! Like subscribing, canceling your subscription is easy as well. They offer online cancellations, which can be done through your account settings. You need to cancel before you’re billed for next month’s box. You can also send them an email or call them to cancel, but doing it online is the easiest way. Since this is already a pretty inexpensive subscription, I was surprised to discover a coupon for $3 off your first box! My first order was only $8.99 after using this deal. “3B1TEA” is the code, and you can enter it at checkout right below the total price. In addition, you can save a little extra with a longer-term Simple Loose Leaf tea subscription. 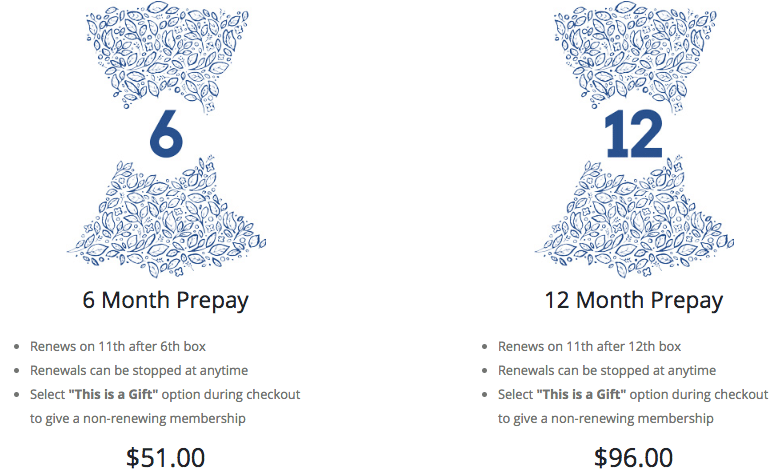 The 6-month term costs $51 (saving $0.50 per month) and the 12-month term costs $96 (saving $1 per month). This isn’t much by way of savings, but you might as well choose this if you already know you’ll be subscribing that long. Although they’re not as common as other types of subscription boxes, there are a few other options to consider when searching for the absolute best tea subscription box for you. This option is more spendy, but you get more tea than in the Simple Loose Leaf boxes. Teabox costs $29.99 per month for five 15-gram bags of premium teas. This is 5 grams more per tea, plus an extra bag (75 grams of tea, total). That’s nearly double the amount that comes in the Simple Loose Leaf boxes. Like Simple Loose Leaf, Dollar Tea Club is a pretty inexpensive subscription. They advertise their $1 tea club (which actually costs $5.50 when you add the price of shipping). This contains three new teas to try per month, and each bag makes 2–3 cups each. They also have better value subscriptions with more tea. You can select from an array of options to fit your tea-drinking preferences! This tea subscription delivers top-quality and award-winning teas from all over the world. Their delivery options are flexible, and they have four different boxes to choose from (original, black, pure, or herbal teas). A bit more expensive than Loose Leaf, it costs $25 per box and comes with four teas in 1 oz bags. This makes between 30 and 50 cups! When placing my first order, I chose the box option that includes all different kinds of tea. This provides one black tea, one green tea, one caffeine-free, and one surprise tea that fits the season. I ordered my box near the end of January, and it arrived at the very beginning of February. The shipping speed was very quick! As long as you order by the last day of the month, you’ll receive the following month’s box. My teas came in a little mailer box with their branding on the front. At just $8.99 for my first box (thanks to the Simple Loose Leaf tea coupon), I was impressed by the nice presentation. Inside, I discovered four teas in resealable paper bags. There were also four linen drawstring bags to steep them in and a card that provided information about each tea. It shared details about the brand, where it was sourced, tasting notes, and other interesting details. They also share specifics about brewing the tea. One of my absolute favorite black teas has strong orange notes, so I was excited to try something similar without the caffeine. This one smelled delicious! It’s sourced from Africa and made of rooibos, orange peel, hibiscus, rosehips, apple pieces, safflowers, and rose petals, plus orange, vanilla, and lemon flavor. How amazing does that sound? It was my favorite in the box and was just as yummy as it sounds. The black teas are likely to be a favorite in these Simple Loose Leaf reviews. This one is called Blue Lady Grey and is made with whole leaf black tea, blue mallow blossoms, lavender flowers, and bergamot flavor. It was sourced from India. Like the previous tea, this one smelled amazing and tasted great! Recently, I’ve been drinking just plain black tea, so this was a great upgrade. This was my least favorite tea in my Simple Loose Leaf Tea review, but that’s simply because I’m not the biggest fan of green tea. The only type I love is matcha (with sugar added). Even so, I like green tea with particular flavors and some sugar. I just can’t drink it by itself. This one was yummy after a little sugar! Oolong is another one of my favorite teas! It’s the most caffeinated tea, so I try not to drink a lot of it. I love a cup every once in a while, though. This one was from China, and it was delicious! Overall, I really enjoyed this loose tea box. It’s very affordable, and it was fun to try the four different monthly teas. I love how they include the linen steeping bags as well as information about each tea to enhance the tea-tasting experience. The only downside for me is the small amount of tea—I usually drink a cup per day, so my Simple Loose Leaf teas ran out quickly. I’ll likely try a larger tea subscription box like Dollar Tea Club or Tea Runners because of this.